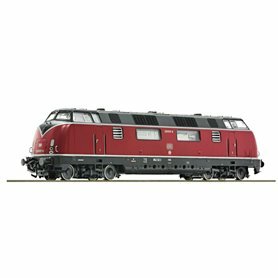 Diesellok klass BR 218 typ DB Netz "Bahnbau Gruppe"
Diesellok klass CFL 1802 "Svensk Tågkraft" digital. Diesellok klass CFL 1802 "Svensk Tågkraft" med ljudmodul. Diesellok klass CFL 1802 "Svensk Tågkraft"
With the liberalisation of the international rail goods traffic established in 2001 the newly founded rail operators needed to procure motive power in order to be able to handle the traffic they had fought so hard to take away from the state owned railways. The procurement of technically sophisticated new vehicles was often not possible due to budgetary restraints. 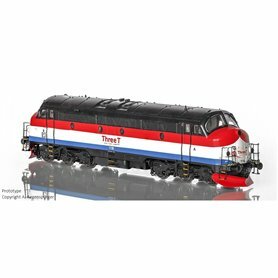 A more cost effective solution was offered by the American Electro Motive Division (EMD) with the class 666 that had already been tested and proven in Great Britain. 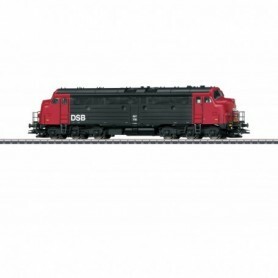 The locomotives known as the JT 42 CWR are based on the American SD40 and ongoing development culminating in the SD 40-2, which were found to be most reliable due to their simple, but proven design. 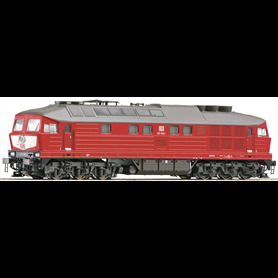 The first railway institution employing the diesel electric class 66 on German lines was the Harbour and Freight Services AG in Cologne the so called Häfen und Güterverkehr Köln AG (HGK). In 1999 this company purchased two units. Almost at the same time the class 66 was introduced to other European countries. Rail traffic corporations having purchased or leased class 66 locomotives can be found in France, Belgium, the Netherlands, Luxembourg and Norway. So far about 650 units have been delivered in two different version to European customers. The somewhat long and slim outline meets the clearance diagram of British Rail. The square-edged design of the body and the chassis with its massive boogies and quite a number of seemingly confusing pipes and cables give the class 66 an unmistakable appearance. The General Motors twelve Cylinder Two Stroke engine 12N-710G3B-EC can not only be heard but also recognised due to its characteristic sound and offers a power of 3194 HP (2350 kW). The starting tractive effort amounts to 409 kN, the continuous tractive effort is 260 kN. With a maximum speed of 120 km/h the class 66 locomotives can easily keep pace with other trains using electric traction even on mainlines. 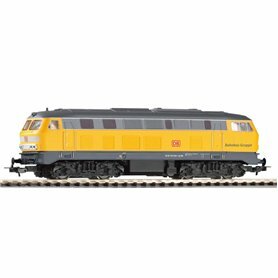 Due to the independence from centenary the client can, if need be, pick up the train from the most remote spur or siding and take it via DB mainlines right through to his own factory. 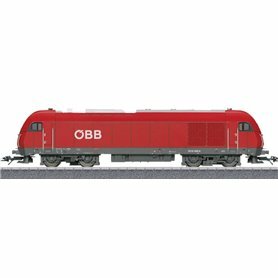 With their livery the class 66 locomotives form a pleasant contrast to the standardized red livery of the DB AG. 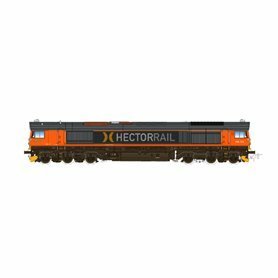 Since 1999 the HGK mainly handles block trains with their class 66 locomotives albeit with varying loads. Tank cars have been a standard load for HGK class 66 locomotives taking the train over the entire route to Braunschweig, Ingolstadt, Marktredwitz and Aichstetten. But one can also find the locomotives from Cologne in central Germany whenever they haul a train to Leuna or Berlin, amongst others. We have chosen the DE671 built in 2003 and with an extended concession issued in 2011 as the prototype for our model that bears white stripes on the front. 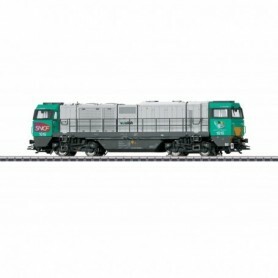 The livery of the class 66 locomotives is accentuated by the sharp contrast of black or grey sides with the light green contrast patches leading around the cabs. In Germany, Belgium and the Netherlands the Captrain locomotives are mainly deployed hauling container traffic, block trains consisting of tank wagons or coal cars. They also display their power ahead of block trains made up of cars with sliding sides carrying parts for the automotive industry. In Germany these six axle locomotives regularly travel from the Rhine Ruhr region as far as Berlin. 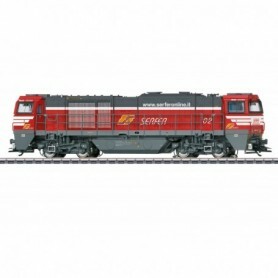 As from 2010 CB rail, a renter of locomotives sent their German and Luxembourg subsidiaries under the name of Ascendos Rail Leasing GmbH into the game of rail freight traffic. For operations on only partly electrified lines Ascendos has a stable of 20 class 66 locomotives and an extra three class 77. 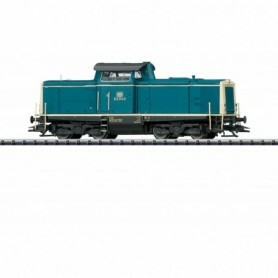 For Modeltrain enthusiasts these locomotives with their green livery accentuated by the turquoise and yellow contrast stripes are highly attractive since they are not only deployed to haul block trains with containers, tank cars, construction materials, coal, motor vehicles or machine parts but make themselves useful in track maintenance service of for transfers of other vehicles. Particularly in the area of construction site logistics these locomotives are often seen with only a handful of cars. 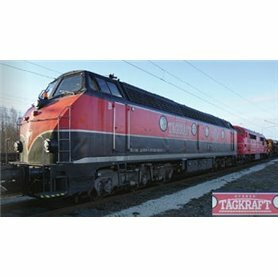 Well known companies renting these six axle locomotives have been and are the HGK, Crossrail, ITL or the Ruhrtalbahn deploying them all over Germany, Belgium and the Netherlands. The four units owned by the SNCF Benelux and regularly travelled through Belgium, the Netherlands and Germany in their impressive and very elegant blue silver livery. Initially it was quite easy to differentiate them due to their different design of the contrast areas on the front and rear. They were mainly hauling two axle hoppers, container trains and tank car trains. The class 66/77 is equipped with a load dependent, synchronised smoke generator, which – subject to the actual load – generators different amounts of smoke. The integral sensors assuring prototypical sounds in curves, is controlled by the brand new LokSound V4.0 M4 decoder. 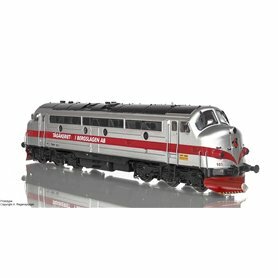 Besides DCC with RailComPlus® this jack-of-all-trades also supports the M4 protocol and registers automatically with the ESU ECoS or the Märklin® central station. 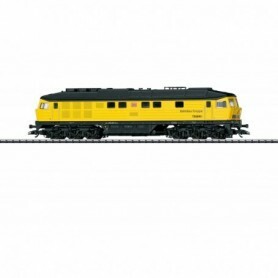 Since it also supports Motorola® and Selectrix® the ESU class 66/77 can be controlled with any popular command station. The integral PowerPack energy storage assures trouble-free operation even on dirty tracks. 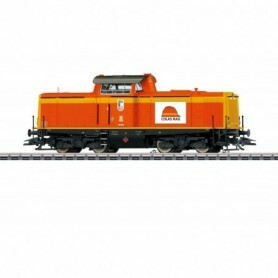 The typical sound of the two stroke diesel engine is reproduced perfectly by two quality loudspeaker emitting sound through two etched air grills on the roof. Complete lighting including cab lighting, driver´s cab-control panel and appropriate lighting for shunting mode with warm white LEDs rounds of the outstanding technical features. All possible lighting scenarios known from the prototype can be displayed including the Belgian “blinking warning lights” typical for that country as well as the two headlight mode. The chassis and the housing of the model are made of high quality metal contributing greatly to the weight of 590 grams assuring adequate pulling power. The ESU models replicate all variations of the different production runs. 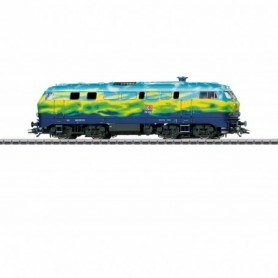 Thus the ECR locomotive has air conditioners on the roof, wind shields on the side windows and rectangular buffers. As is the case on the prototypes you will find different types of covers for the battery compartments. The class 66 and 77 are technically typical hybrid models. The wheel sets with an inner spacing of 14.1mm allow trouble-free operation on both, 2-rail or 3-rail tracks. For 2-rail tracks you only have to remove the centre pick-up with the tool provided. That´s it. 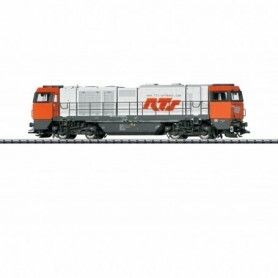 Model train enthusiasts who prefer to run their locomotives without traction tires and rather enjoy more prototypical wheels sets find a voucher for six wheels sets (2-rail system) with Rp 25 wheels. Set into the chassis is a five pole skew wound precision motor with optimised “silent” commutator – developed by ESU. This provides power tamed by two flywheels via a combination of worm gear / helical gear box to four of the six axles. LEDs mounted on the boogies facilitate realistic flicker during braking.